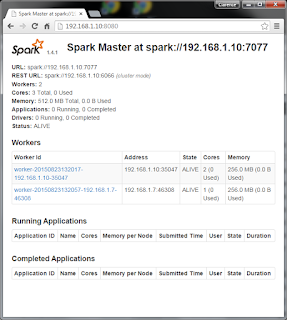 After setting up Apache Spark on UDOO, I tried to setup a cluster by adding a Raspberry Pi. Here are the steps. In this setup, UDOO will be both a master and a worker. Another worker will be on a Raspberry Pi. 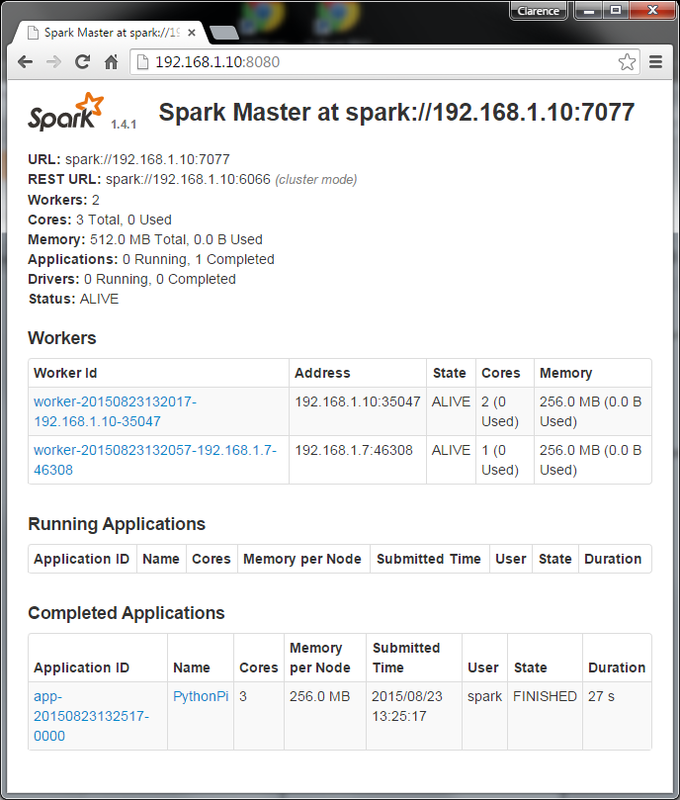 A user account "spark" is created on both machines. Each machine has Apache Spark placed under its home directory (e.g. 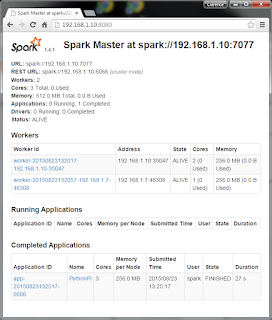 /home/spark/spark-1.4.1-bin-hadoop2.6). For reference, my UDOO is running Arch Linux (kernel 4.1.6) with Oracle JDK 1.8.0_60, Scala, 2.10.5, and Python 2.7.10. Hostname is "maggie". Enter password when copying the key to spark01 (the Raspberry Pi). Once it is done, try to ssh to spark01 again and no password should be needed to login. 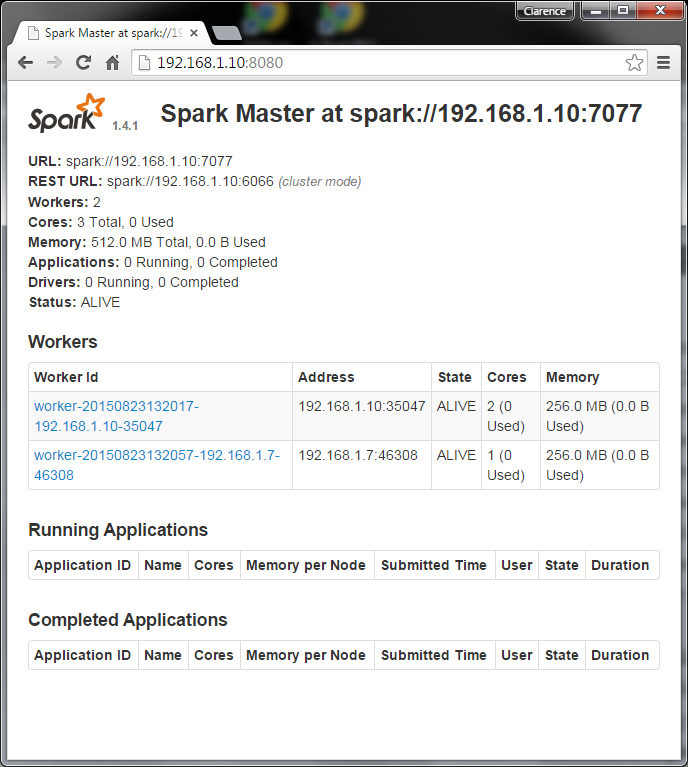 Once ssh is configured, we can setup Spark itself. Note that the second line is "localhost", which will start a worker locally on UDOO. Also on the master machine, copy conf/spark-env.sh.template as conf/spark-env.sh and uncomment / edit the followings. SPARK_MASTER_IP points to the address of my UDOO. The number of worker cores is set as 2 since we will be running the master on UDOO too so better not let it uses all 4 cores by default. Worker memory set as 256MB. For other options, refer the Spark site. You can also start master and individual slaves separately. Refer to the Spark document for other commands. Check the console and logs folder for any error messages. Strangely, on my setup, the console has error messages but in fact both master and slaves are ok.
You should see two workers connected to the cluster. (Wait for a minute or two, it takes some time for the worker on Raspberry Pi to startup). We can then submit a job to the cluster, e.g. Refresh the web UI to monitor the progress. On my setup, the UDOO workers usually pick up application much quicker than Raspberry Pi, so with simple test like this, no job will be run on Raspberry Pi at all. Remove UDOO from the conf/slaves list to test only the Raspbery Pi if necessary.